PVC windows are a relatively new window frame material for home windows – they are strong, provide excellent flexibility and are very cost effective. PVC windows look like traditional vinyl windows (at least to the “untrained eye”), but they are much stronger and don’t weigh any more. PVC windows offers lots of benefits that make it a viable window frame for many homeowners. PVC is a thermoplastic polymer that is created from a foam extrusion process, making it lighter, stronger, and better insulating than vinyl. It weighs about the same as wood and looks similar to vinyl. It offers about 60% more insulation than wood (and about double the insulation of vinyl). Unlike wood, it is resistant to water, weather, pests and rotting. It is also virtually maintenance free, which is a huge draw to using the material. These are at the lower end of the pricing scale, although high quality options are considered to be in the mid range. The following would apply to standard sized double hungs. PVC is a relatively low cost material option. Even if you find lower cost options, you should make a decision not solely based on price, but on what you stand to gain in the long term. By choosing a high quality material such as PVC for your windows, you will spend less money on maintenance, won’t need as many repairs, may have lower utility bills due to increased energy efficiency, and won’t need to replace your windows anytime soon. 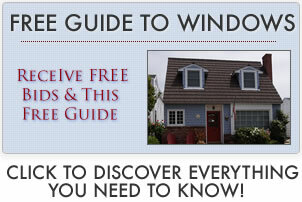 Discover more on what replacement windows cost. Choose from between all PVC windows or PVC clad wood windows. The latter has PVC exterior frames, but the interior frame is wood. The interior frames can come in different types of wood, as well as different finishes. They allow homeowners to paint or stain the frames and trim to match the home’s interior décor. More on window frame types. In addition to being able to withstand high heat (up to 150 degrees Fahrenheit! ), the material does not expand or contract when the weather changes, and will not warp, splinter, crack or swell. The material is also not prone to damage caused by water and moisture, such as rot and the development of mold and mildew. PVC will last longer than wood and won’t require the constant window maintenance that wood requires. Even if painted, the paint will last longer than that applied to wood and won’t easily peel or blister. The material won’t splinter or crack the way wood can and will not require repairs due to rot, moisture damage or insect damage. PVC does not absorb paint the way wood or some other materials do, making it easy to paint and requiring that less paint be used to complete the application (which saves money, too). This material offers 60% more insulation than wood and about double that of vinyl, creating more energy efficient windows. Since the material itself is flexible, it can easily be bent into almost any shape. This is especially beneficial for arched and round windows. Unlike wood windows, you don’t have to worry about termites and other insects causing damage to the material and increasing the likelihood of rotting and deterioration.